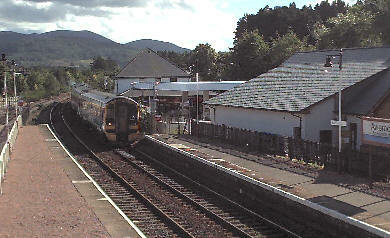 Top: The railway is almost incidental to this scene of the sun setting on Ben Nevis viewed over the Scotrail trains stabled in Fort William station. Centre: A pair of Class 158 diesel units arrive at Aviemore station en route for Inverness, in the background you can see the Cairngorm Mountains. 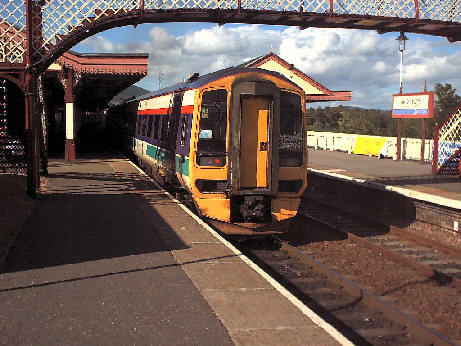 Bottom: The same pair of units seen standing in Aviemore station. Across the fence on the right is the section of the station used by the preserved Strathspey Railway which runs as far as Boat of Garten along the former mainline route to Aberdeen.